Rogers City Hurons at practice with 17-year Head Coach Karl Grambau. Rogers City, Mich. — The Rogers City Hurons softball team made the farthest playoff run in Northeast Michigan in the 2018 season. They took their talent to the state semifinals where they lost to Coleman 2-0. This season the Hurons look to make another deep run with a brand new team. 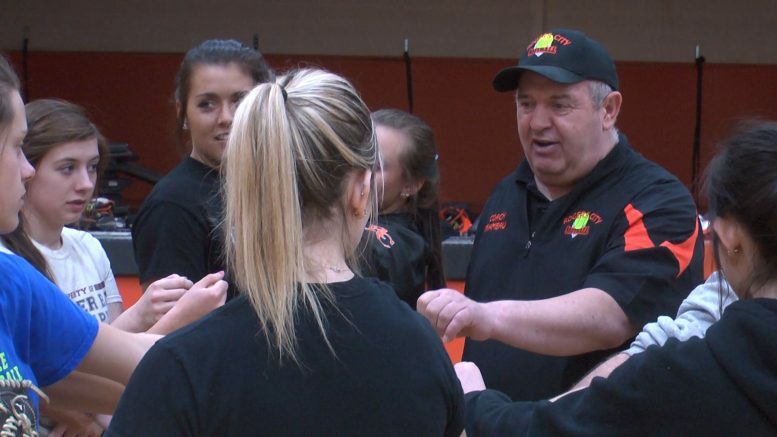 Focus is what earned Rogers City their third consecutive Regional title in 2018. Now Head Coach Karl Grambau, in his 17th season at the helm, will look to rebuild after losing five key players. With practice, the young roster can help keep the winning tradition alive in Rogers City, but it starts in the batters box. Senior Catheryn Hart hit a home run during Rogers City’s scrimmage against Alpena. Proving that there is still fire power on this team. Now on defense the Hurons are quick and can track the ball. That will help their three-person pitching staff of junior Kyrsten Altman, Hart and Fleming. Rogers City will put their young roster to test in a few tournaments as they prepare for the long season ahead. The Hurons are on the road until Monday, April 22nd against Hillman.